It's tough fighting crime and all but The CW's superhero series sure seems to take a lot of time off. After the Olympics put Arrow on the sidelines for three weeks, the team returned for only two battles before scheduling another break. Facing Clock King in "Time of Death" was taxing but nothing compared to trying to make big bad, Slade Wilson break "The Promise" he made in the past. Maybe they do deserve a rest. Oh, and it does allow the network another week to hype the "Suicide Squad" episode which looks, well, epic. The best DC movie, is a TV show. Since I was just hyping the Suicide Squad, I might as well start the easter egg discussion by talking about the group of prisoners in "The Promise." 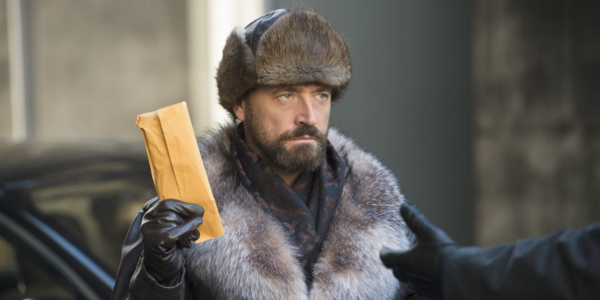 The series' return to the freighter meant catching up with Ollie's old buddy Anatoli Knyazev (also known as KGBeast), a DC character first introduced in "Crucible" before helping Dig on his mission to Moscow for A.R.G.U.S. in "Keep Your Enemies Closer." As far as the other inmates who would soon become castaways with Sara, there was Reverend Thomas Flynn and Hendrick Von Arnim. Now. Those names means nothing to me but the former could be a reference to either Pied Piper or Ratchatcher, you know, on account of his little friend Abraham. 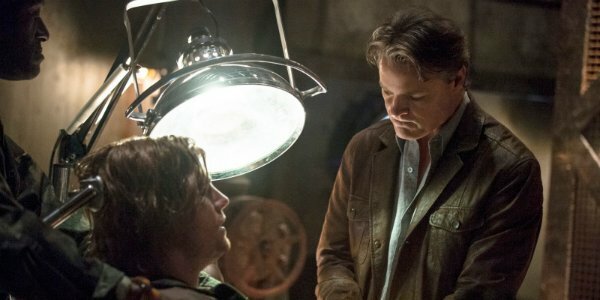 The Pied Piper inclusion would be interesting because Hartley Rathaway is going to be a villain in the Flash pilot, however, the mouse is really the only reason for this line of thinking. That and one of the Piper's aliases is Thomas Peterson. A shared first name and a rat. Might be more than linking Flynn to Ratcatcher, Otis Flannegan. Flynn-Flannegan. Finally, angry one arm pull ups is Hendrick Von Arnim and, once again, that doesn't ring any immediate bells. Could Hendrick be a placeholder for Henrich? Pure speculation. For there to be a prison break, and what an extravagant prison break it was, there have to be guards as well as inmates. Dr. Ivo is the man running the floating jail and he embarked on his journey aboard the Amazo in order to find a cure for his sick wife. You know, some kind of mythical miracle drug that may have been created and lost by the Japanese in WWII. An ailment in the family is a popular theme for DC villains, something I mentioned while breaking down last week's battle with the terminally ill WIlliam Tockman. One thing that has been driving me nuts about the flashbacks since Ivo shot Shado is how it's been played as Oliver's fault and not just as the catalyst for the split with Slade. I get that the mirakuru messes with a man's judgment and it works as a bridge between our hero and (soon to be one-eyed) villain but why Ivo seems equally convinced that the 'kid' is responsible for her death is beyond me. And infuriating. Off with his arm! You think he'll be back looking for some drugs? And maybe that eye he needs for research? Of course, we saw a missing eye at the end of this week's episode but we already know that Ollie was the one who does the taking. Or should I say, is going to be the one to do the taking? Despite the lack of an arrow through the eye, "The Promise" still served as an(other) origin story of sorts with both Deathstroke donning his dual colored mask and the Green Arrow putting on the hood in honor of Yao Fei. Slade is quick to forget who originally bonded with the Shado's family on Lian Yu. I could only imagine Yao's reaction when Ollie pulled an Edmure. Similar to the Blackfish, I imagine. Game of Thrones fans know what i'm talking about. A major part of Deathstroke's rise was the aforementioned disclosure of the actual circumstances surrounding Shado's death and when he took over the freighter all I heard was "I'm the captain now." The Australian mercenary also mentioned his former buddy Billy Wintergreen when producing the rum for their final drink as friends. Their next taste of Reuther Rum is most definitely as foes. Even though the majority of the fifteenth episode was spent in the past on the island, there are a few crucial scenes in the present as Oliver finally learns that Slade Wilson didn't die from the arrow in the eye. As you saw in "The Promise," it takes a lot to take a mirakuru man down. The serum also serves as a way for Slade to amass both money and an army to rival his former friend. At least, I think that's how the big bad could afford to donate to Moira's campaign and finance her rival, not to mention drive that fancy car. And as Ollie was walking him to it, waiting for Dig to pull the trigger, the superhero at the head of Team Arrow learned that his nemesis has a team of his own. There's the man in the skull mask, also known (to us, not to Ollie) as Sebastian 'Brother' Blood and his deceased grunt Cyrus 'Solomon Grundy' Gold. Is Gold still part of the team? Well, there's no evidence to suggest that's the case. Also, none to suggest otherwise. "Solomon Grundy, Born on a Monday..." Is there anyone else on Deathstroke's team? Cause, as Slade found out at episode's end, our heroes together make a formidable adversary. 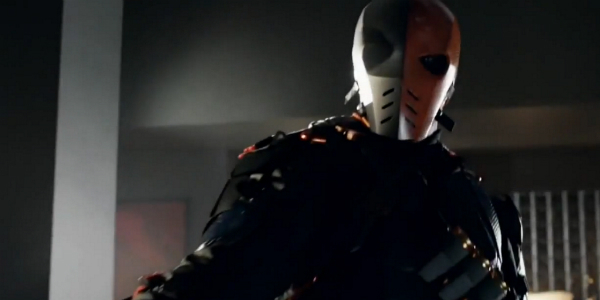 To battle Deathstroke and his soldiers, Arrow has assembled his own rag-tag team. I loved the way that they all filtered into the Queen house at the end of "The Promise" for the silent showdown, each of the members getting a mention from the villain. There's the boy with the firm handshake, the girl who came back from the dead and the guy who's, uh, not dead in the bushes. Sorry, Dig, you didn't get to take part in the tension filled stand-off that managed to keep Moira and Thea in the dark. Neither did Felicity but she was there in spirit. And it can't be long before Speedy joins the team too, right? Ollie's not calling his little sister that nickname for no reason, not to mention that her boyfriend is about to make his mark as the only member who can physically shake Slade as a fellow miracle man. 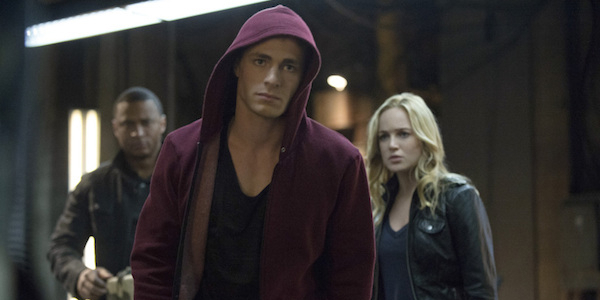 Roy 'Red Arrow' Harper hasn't had a lot of scenes since being officially recruited to the group but it looks like Canary has been training him to fight and keep his cool. Sara's also another shock for Slade but, as I said before, she might not be the only one back from the dead come the final fight. That's still several episodes away. Next is the Suicide Squad. 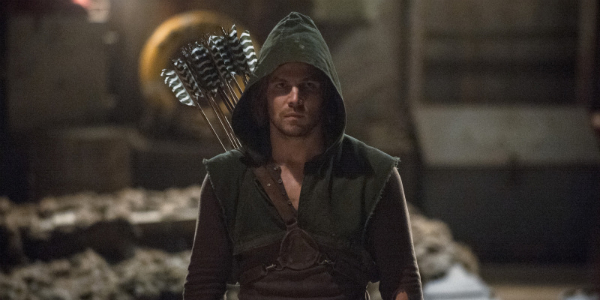 Arrow returns with Episode 16, "Suicide Squad," Wednesday, March 19 at 8 p.m. ET on The CW. Created by Marc Guggenheim, Andrew Kreisberg and Greg Berlanti, the DC Comics inspired series stars Stephen Amell, Katie Cassidy, David Ramsey, Emily Bett Rickards, Willa Holland, Colton Haynes, Manu Bennett, Paul Blackthorne and Susanna Thompson.